There is a species of cicada (“chicharra” in Spanish) that strikes me as quite common in the central Humid Pampas region of Argentina. I saw numerous individuals during March of last year at La Reserva Ecologica Costanera Sur (where these photos were taken), and again during the past week I’ve noted them abundantly in the trees around my base station in western Buenos Aires Province. 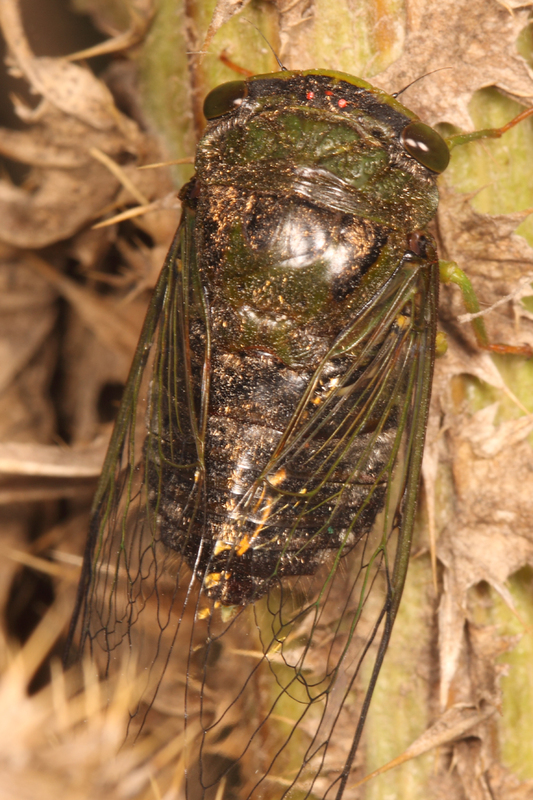 Thanks to cicada expert Barry University’s Allen Sanborn (apparently himself an endangered species), I now know these to be the species Dorisiana drewseni (Stål, 1854), occurring in Argentina, Uruguay and southern Brazil (Aoli et al. 2010). As in North America, the song of the cicada is associated with the dog days of summer and their midday heat. “Chicharra que canta, calor adelanta” is a Spanish idiom that loosely translates to “Cicadas singing, heat follows”. March is late summer in Argentina, and the days can still be quite hot even at temperate latitudes (yesterday was 34°C, or 93°F). 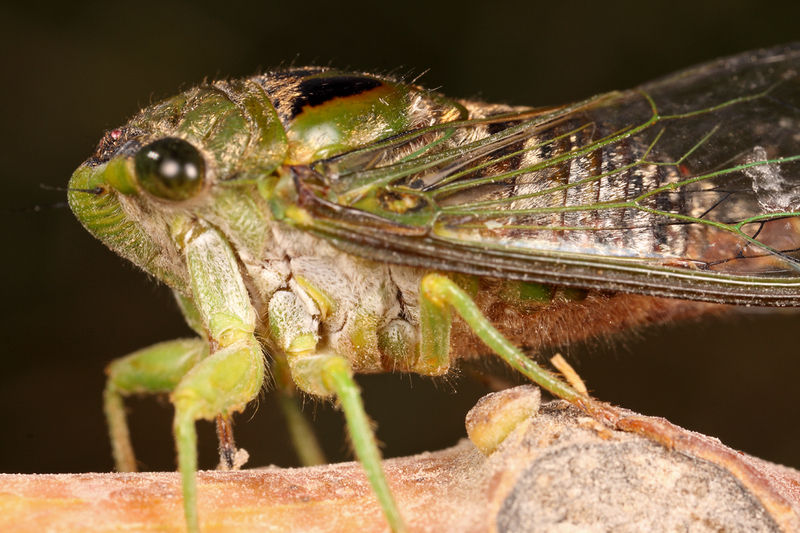 Despite being half-a-world away from St. Louis, the droning song of the cicada sounds a bit like home in late August. While I was at the Reserva last March I really wanted to photograph a male in the midst of song, but the above photo was the only shot I managed from several males. Singing males are extremely difficult to approach to within even a long-handled net’s reach—much less a camera lens’ focal distance. I think the only reason I was able to photograph the male above was because I approached him from slightly below and behind (though certainly still within the field of vision of those huge, bulging eyes). One shot was all I got, and off he flew, shrieking noisily as he crashed and thrashed through the foliage before reaching open air and completing his escape. Females, on the other hand, seemed to be much more approachable (perhaps because they, unlike singing males, never do anything to draw attention to themselves). The female in the photo above was calmly sitting on a thistle-like plant at eye-level, never flinching at my approach (albeit cautious) and calmly staying put while I snapped a few photos. One look at her tattered wings, however, suggests that she had already seen better days and perhaps no longer had the strength to attempt to flee (maybe even expectedly awaiting predation at this point in her life). Not long after taking the photographs of the first female, I saw another female sitting on a tree branch. As I mentioned, females don’t call attention to themselves the way males do, so finding females is a bit more of a crapshoot—I only happened to see this one because she was on a tree branch at eye level with an unobstructed view hanging right next to the path I was following. Obviously much fresher and in better shape than the previous female, she nevertheless allowed me to get as close as I wanted, with the photographs above and below representing the two that I am happiest with. That's one heck of a cibarial pump! I haven’t had quite the same luck during the present trip in securing one of these—probably because my lone attempt so far was during the heat of the day on a day that was already warm enough. Come to think of it, I didn’t manage any of the above photographs last year until quite late in the afternoon when temperatures began to drop off a bit. We’ll see what the next few weeks brings—I am still committed to getting the money shot of a male in the midst of his song. Chicharra que canta, Ted adelanta! 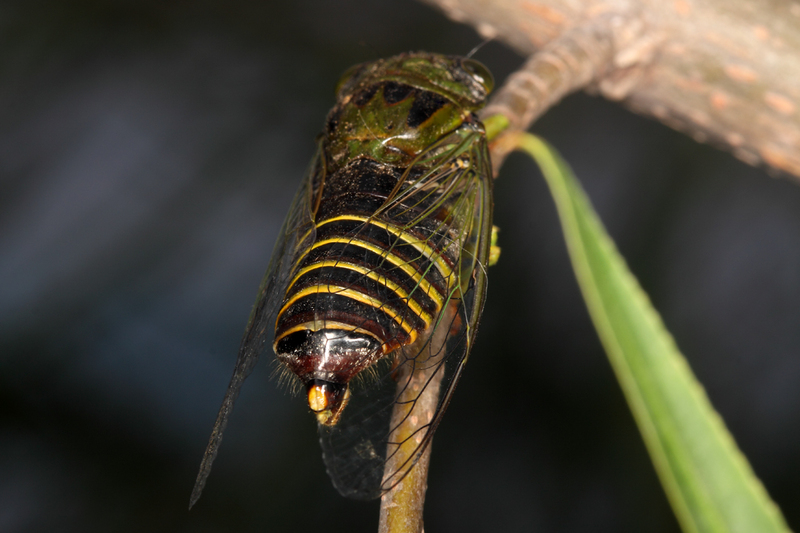 This entry was posted in Cicadidae, Hemiptera and tagged Argentina, bugs, cicadas, entomology, insects, nature, science. Bookmark the permalink. Thanks for the guide! 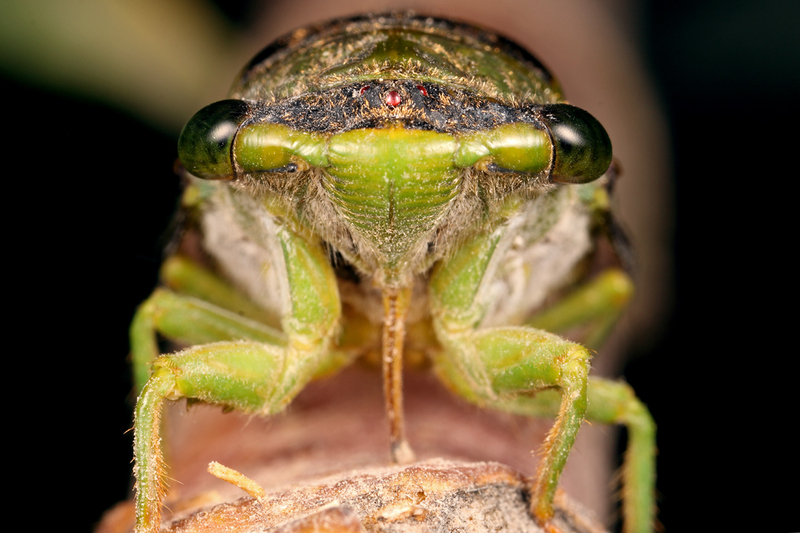 Did you have a look at my cicada photo on my blog? The soundtrack of the summer. Saludos.